Councils are encouraged to perform fundraising events each year to assist a local religious or civic project. CHFS assists the Councils with their fraternal work by matching all or a portion of the funds raised for the charity. The recipient of the funds and the type of event are the decisions of the Council. In order to provide smaller Councils with an opportunity to contribute to a local fundraising project, the Matching Gifts program was established. A Council may donate up to $150 to a worthwhile organization, parish or individual in need. The National Council will match that amount. Each year a Council may receive a grant of up to $600 to do a small work or service project in their community. The grant is designed to give members an opportunity to assist a needy family or parish project by purchasing materials and supplies. The members provide the volunteer labor to complete the work. Honoring Councils who meet the stringent requirements for fraternal activity and service, the National Council increases both Matching Funds and Hearts and Hands grants to Silver Star, Level I and Level II Councils. Councils are invited by CHFS to hold family picnics, corporate communion breakfasts and dinners. These social events help to build council interest and assist members in becoming acquainted. Members who attain 20 and/or 50 years of membership in CHFS receive membership pins. These are presented in recognition of the loyalty and faithfulness of the member. Catholic Holy Family Society partners with various local Habitat for Humanity chapters and constructs a Habitat home every year. Please visit the Habitat for Humanity webpage for more information. 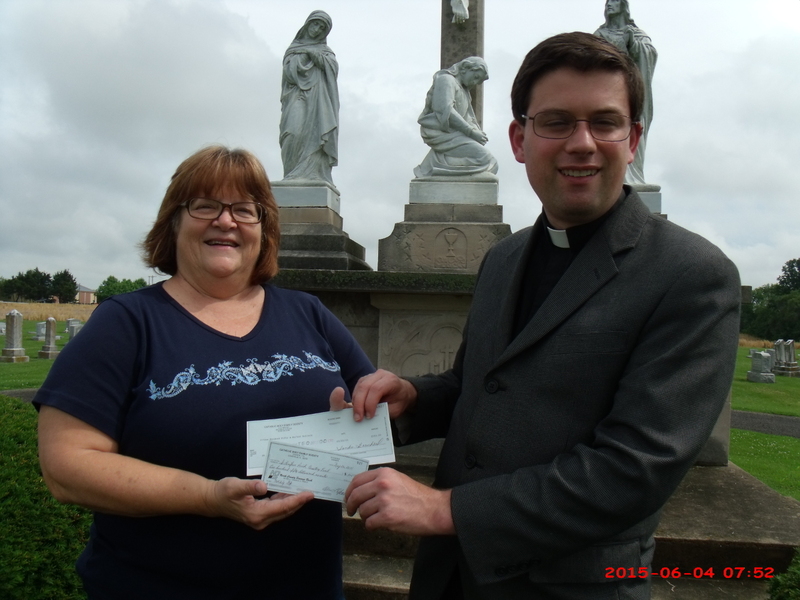 Council 82: Breese, IL Council 82 donated their Hearts and Hands Funds toward railing at St. Augustine Church in Breese. Pictured (L-R) Dolly Lampe, Jim Richter, Helen Timmermann, Father Chuck, Therese Jansen , Joan Foppe and Bob Jansen. Council 82: Clinton County Senior Services received a $200 Silver Star donation from Breese, IL Council 82 on August 18th. 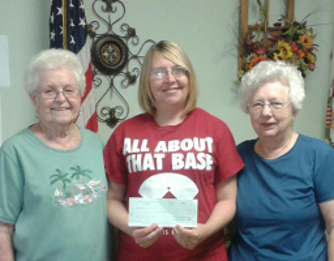 Presenting the check to Lisa Gent, Director, Clinton County Senior Services are Fraternal Secretary Theresa Jansen (L) and Council member Dolly Lampe (R). 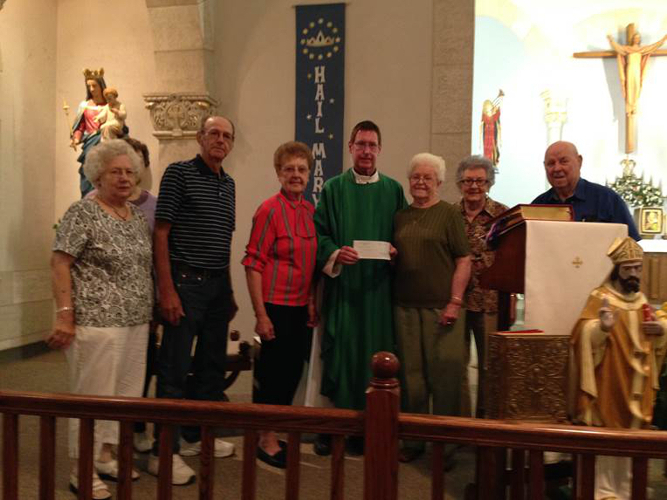 Council 85: Beckemeyer, IL Council 85 presented their Matching Funds gift from a rummage and bake sale at St. Anthony’s Parish in Beckemeyer. Pictured in the front row (L-R): Kathy Pingsterhaus, Karen Beckemeyer, Deb Keilbach, Lou Lippert, and Gertie Holthaus. 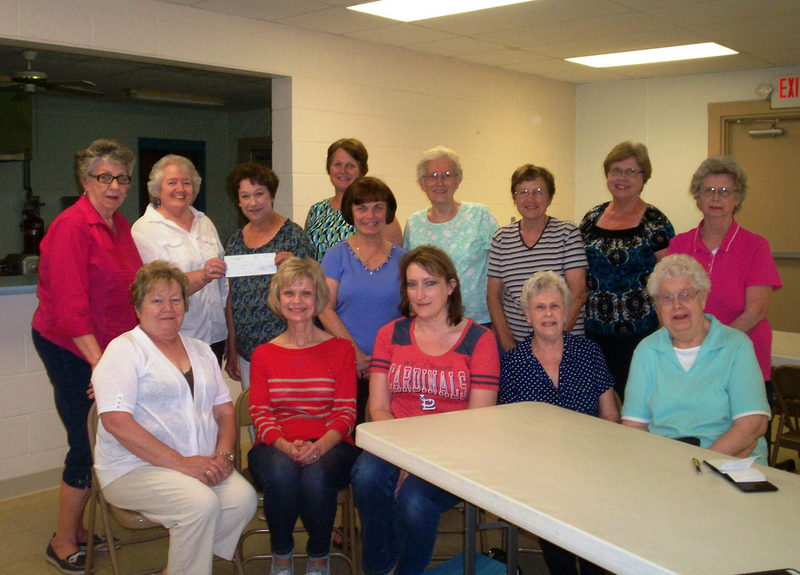 Back row (L-R): Rita Edmonds, Audrey Davis presenting check to Janette Kruse (co-chair), Betsy Kampwerth (co-chair), Rosie Kapp, Florence Pingsterhaus (co-chair), Rita Deiters, Etta Kampwerth, and Rosemary Kampwerth. 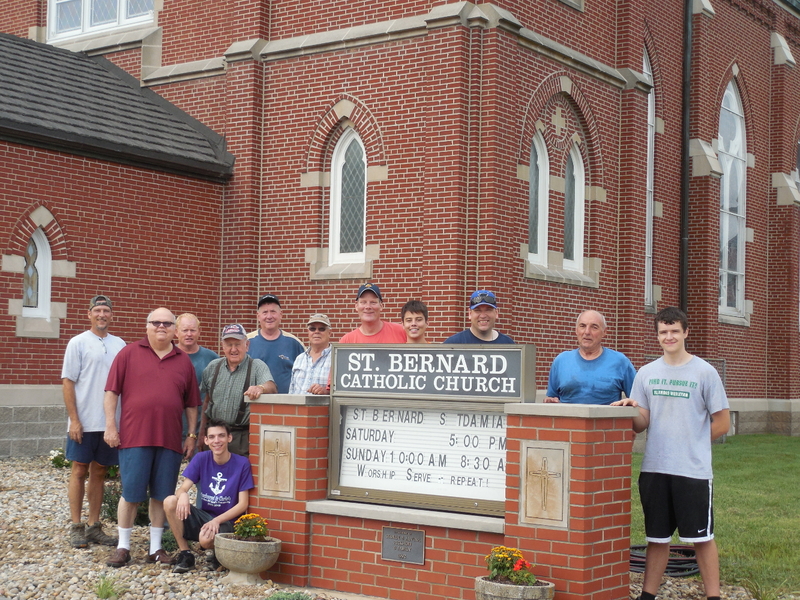 Council 89: Albers, IL Council 89 used their Hearts and Hands Funds toward new landscaping at St. Bernard’s Church in Albers. Volunteers pictured with Father Jack include Council, Parish and Knights of Columbus members. Council 104: Piopolis, IL Council 104 Presented their Matching Funds gift to St. John the Baptist Catholic Church in Piopolis toward CYM Convention for Youth expenses. Pictured in the front row (L-R): Cindy Billington, CYM Moderator, Tillie Kaufman, Council President and Rachel Hopfinger, CYM Moderator. Back row (L-R): Hamilton County CYM Members Rylynn Coy, Ramsey Clark, Sam Lueke, Brent Beard, Sawyer Lueke and Austin Redmon. Council 113: Evansville, IL Council 113 President Jo Ann McConachie presented the Council’s Matching Funds Gift to be used toward the St. Boniface Cemetery Fund Drive to Pastor Benjamin Stern. 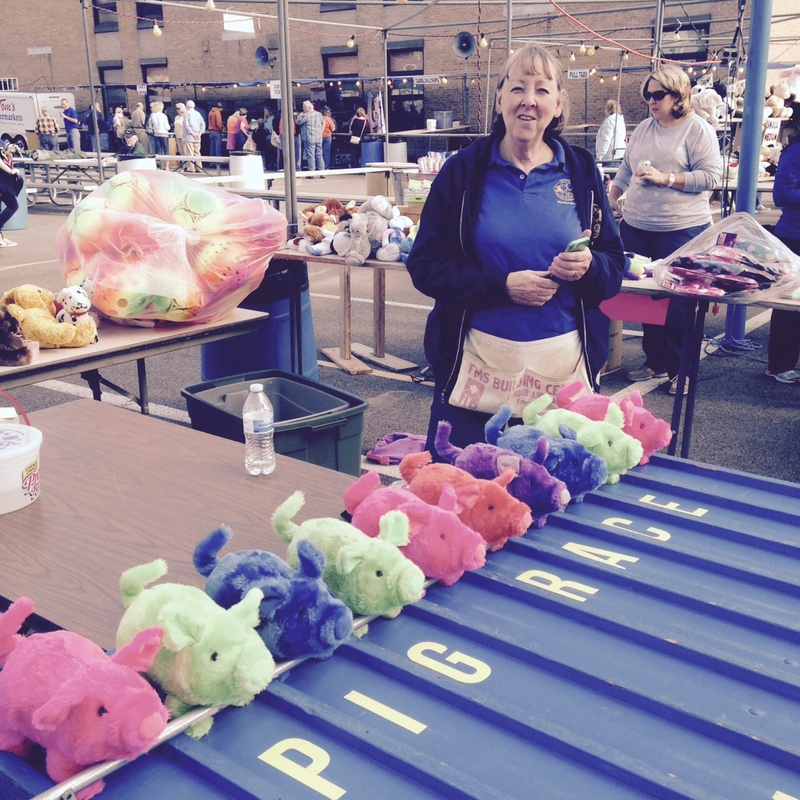 Council 10: Freeburg, IL Council 10 member Mary Jackson working at the pig race. 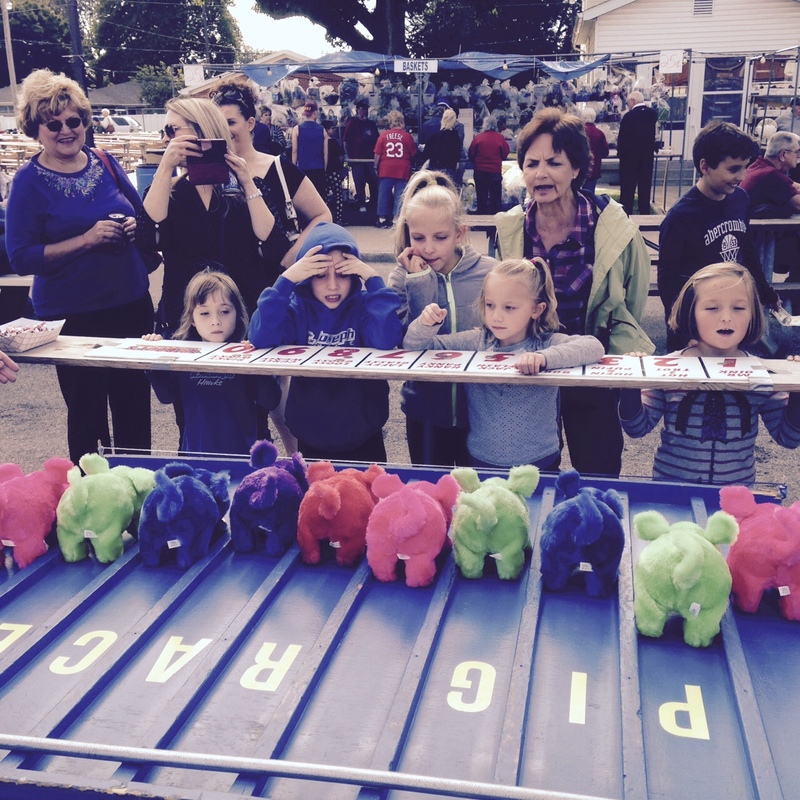 Council 10: Freeburg, IL Council 10 St. Joseph Parish Picnic Pig Races being enjoyed by all ages.